There's some uses for this, but not many. I can imagine Nodens followed by a Slime Mold to be useful if there are a ton of characters that happen to have toughness, or if your opponent is relying on Dutch Courage or something. But most of the time this will just be a vanilla 2-drop with okay icons. You can do better. Slight tech against Khopesh, but how many wounded characters do you tend to see at any 1 time? Not enough to justify this guy. If Gugs really become a thing in some future expansion then this card will find a home. 2 cost for 2 skill, terror and combat is one of the benchmarks I use to rate a good character in my deck building. His ability is a meta call, if you frequently face an abundance of toughness then he might come in useful. Cheap neutral terror icons are always welcome. Possible new relevance as counter for an Ia! Ia! based Deck. Anything that is tech against Khopesh is worth a look as possible support for Khopesh. 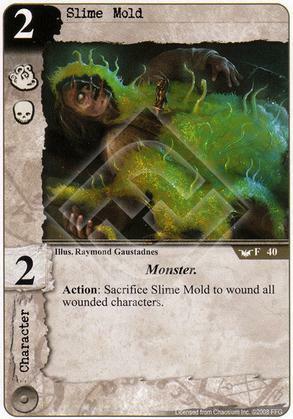 Plus, if you're using The Carpathian to help find Khopesh, Slime Mold is the third leg of a 3-card combo. Combined with good icons for defending stories and buying time, I like it.